The Boeing Model 307 Stratoliner was the first commercial transport aircraft with a pressurized cabin. This feature allowed the plane to cruise at an altitude of 20,000 ft (6,000 m), well above weather disturbances. The pressure differential was 2.5 psi (17 kPa), so at 14,700 ft (4,480 m) the cabin altitude was 8,000 ft (2,440 m). The Model 307 had capacity for a crew of five and 33 passengers. The cabin was nearly 12 ft (3.6 m) across. It was the first land-based aircraft to include a flight engineer as a crew member (several flying boats had included a flight engineer position earlier). In 1935, Boeing designed a four-engined airliner based on its B-17 heavy bomber (or Boeing Model 299), the Model 307. It combined the wings, tail, undercarriage and engines of the B-17C with a new, circular section fuselage designed to allow pressurization. The first order, for two (soon increased to six) Model 307s, was placed by Pan American Airways in 1937, shortly followed by one for six from Transcontinental & Western Air (TWA), prompting Boeing to start production of an initial batch of Model 307s. At the time the US entered World War II in December 1941, flying across the oceans was a rare luxury. But the war required government and military officials to travel across the oceans, and most of the four-engined commercial long-range aircraft were put to this use: Pan Am's 14 flying boats and TWA's 5 Boeing 307 landplanes. Additional fuel tanks were added to the 307s to give them the extra range required. The converted 307s were designated C-75 by the military. Before WW2 ended their production, ten Boeing 307 commercial transports, named Stratoliners, had been built. TWA bought five and flew domestic routes between New York and Los Angeles for 18 months until the Army purchased them following the Japanese attack on Pearl Harbor. The intended wartime use was long-range transatlantic flight with a payload of VIPs or critical cargo. TWA converted their five Stratoliners for military service in January 1942, and its Intercontinental Division (ICD) then operated these C-75's under contract to the Army's Air Transport Command (ATC) until July 1944. These were the only commercial landplanes able to cross the Atlantic with a payload until the arrival of the C-54 Skymaster in November 1942. The Boeing 307 was based on the B-17C with a different fuselage of circular cross section 138 inches (3.51 m) in diameter. Conversion to C-75 included removal of the pressurization equipment to save weight, removal of the forward (four or) five of nine reclining seats along the port side, and alteration of the two forward Pullman-like compartments (of four) starboard of the left-of-centerline aisle. Space was thus provided for crew requirements on extremely long flights and for the addition of five 212.5 U.S. gallon (804 L) fuel tanks. The landing gear was strengthened, the maximum take-off weight was increased from 45,000 lb to 56,000 lb (from 20,400 to 25,400 kg), and the exterior was painted olive drab. The maiden flight of the first Boeing 307 (not a prototype, as it was planned to be delivered to Pan Am following testing and certification), registration NX 19901 took place from Boeing Field, Seattle on December 31, 1938. It crashed, however, on March 18, 1939 while being demonstrated to representatives of KLM, breaking up during spin recovery. The first delivery to a customer was to multi-millionaire Howard Hughes, who purchased one to carry out a round-the-world flight, hoping to break his own record of 91 hours 14 minutes set between July 10-14, 1938 in a Lockheed 14. Hughes' Boeing 307 was fitted with extra fuel tanks and was ready to set out on the first leg of the round-the-world attempt when Nazi Germany invaded Poland on September 1, 1939, causing the attempt to be abandoned. It later had the extra fuel tanks removed, was fitted with much more powerful Wright R-2600 engines, and was transformed into a luxurious "flying penthouse" for Hughes, although it was little used, being sold to oil tycoon Glenn McCarthy in 1949. Deliveries to Pan-Am started in March 1940, with TWA receiving its first aircraft in April. TWA's aircraft were used on services between Los Angeles and New York, while Pan-Am's aircraft flew routes down to Latin America. In all, only 10 aircraft were built, with three being delivered to Pan-Am and five to TWA, together with the one aircraft for Howard Hughes. On the entry of the United States into World War II following the Attack on Pearl Harbor, Pan-Am continued operating its Stratoliners on routes to Central and South America, but under direction of the Army Air Force, while TWA's aircraft were sold to the US Government, being designated Boeing C-75 and operated by the United States Army Air Forces (although normally still flown by TWA crews). The US Army returned the five C-75s to TWA in 1944, and they were sent to Boeing for extensive overhauls and rebuilding. Boeing replaced the wings and horizontal tail with that from the B-17G, while more powerful engines were fitted and the electrical system was completely replaced by one based on that of the B-29 Superfortress. Passenger capacity was increased from 33 to 38. The rebuild cost TWA a total of $2 million for the five aircraft, which re-entered passenger service on April 1, 1945. Although TWA was now committed to the larger and faster Lockheed Constellation, the Stratoliners remained in use, being transferred to regional services, until withdrawn and sold in April 1951. TWA's aircraft were purchased by the French airline Aigle Azur, who used them for scheduled flights from France to North and Central Africa, and later to French Indo-China. The 307s were later transferred to Aigle Azur's Vietnamese subsidiary, and were used by a number of airlines in South East Asia, with at least one aircraft remaining in commercial use until 1974. Pan-Am disposed of its unmodified Stratoliners earlier than TWA, with them being sold to a number of small operators. One aircraft was purchased by the Haitian Air Force, being fitted out as a Presidential transport for Papa Doc Duvalier. This aircraft was later returned to the United States and was purchased by the Smithsonian Museum. Two main routes were flown: Washington, DC to Cairo across the South Atlantic, and New York to Scotland across the North Atlantic. They often flew non-stop the 2,125 statute miles (3,415 km) between Gander, Newfoundland and Prestwick, Scotland in the north, and the 2,550 statute miles (4,100 km) between Natal, Brazil and Accra, Ghana in the south. These were very long flights for the time. After July 1942, a refueling stop at Ascension Island was an option in the south. In the north, stops at Iceland or Greenland were often necessary, especially flying westbound against the prevailing winds. As C-54s took over the Gander to Prestwick route, the C-75s operated a Marrakech to Prestwick service out over the Atlantic. In April, 1945 the five aircraft were returned to TWA, having been restored by Boeing and recertified by the CAA as SA-307B-1 civilian transports with their old registration numbers. The restoration included new B-17G Flying Fortress wings and engines, horizontal stabilizer moved three feet (0.9 m) aft, and B-29-type electronics. 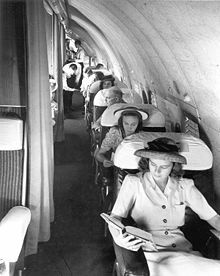 TWA then restyled the interior cabin in two sections, 10 seats forward and 28 aft. 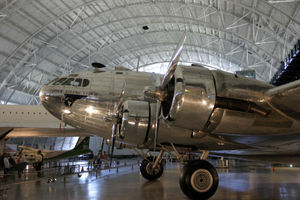 The only surviving Boeing Model 307 (NC19903), operated by Pan Am, is preserved in flying condition at the Smithsonian Museum's Steven F. Udvar-Hazy Center. On March 28, 2002 this particular aircraft was subject to a dramatic crash in which it ditched into Elliott Bay in Seattle, Washington, on what was to be its last flight before heading to the Smithsonian. Despite the incident, it was again restored, flew to the Smithsonian and is now on display. The fuselage of Howard Hughes' personal 307 survives, although it has been converted into a house boat. Bowers, Peter M. Boeing Aircraft since 1916. London:Putnam, Third edition, 1989. ISBN 0-85177-804-6. Ford, Daniel. "First and Last 'Strat':Boeing's Model 307 and its Survivors". Air Enthusiast, No. 110, March/April 2004. Stamford, UK:Key Publishing. ISSN 0143-5450. pp. 54-60. Hardy, Mike. "The Stratoliner Story (Part 1)." Air International, January 2004, Vol 46 No 1. Stamford, UK:Key Publishing. ISSN 0306-5634. pp. 21-24. Hardy, Mike. "The Stratoliner Story (Part 2)." Air International, February 2004, Vol 46 No 2. Stamford, UK:Key Publishing. ISSN 0306-5634. pp. 69-72. Taylor, H.A. "Ten Big Boeings...The Stratoliner Story". Air Enthusiast, Ten, July-September 1979. Bromley, UK:Fine Scroll. pp. 58-67.